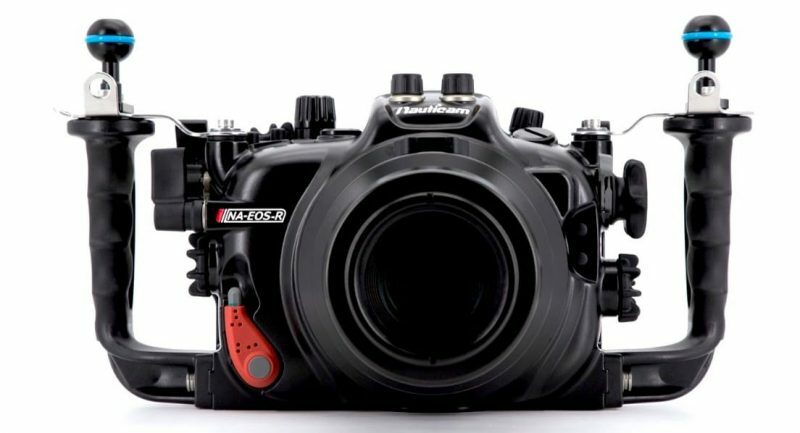 With the Canon EOS R camera, underwater image makers are seeing a full-frame mirrorless camera that incorporates Canon’s dual-pixel autofocus! The EOS R has the ability to be used with the EF lens lineup via an adapter, or the new RF mount lenses with breakthrough features. The EOS-R features a 30.3 MP Full Frame CMOS sensor using the new RF lens mount and a 3.7M dot electronic viewfinder. 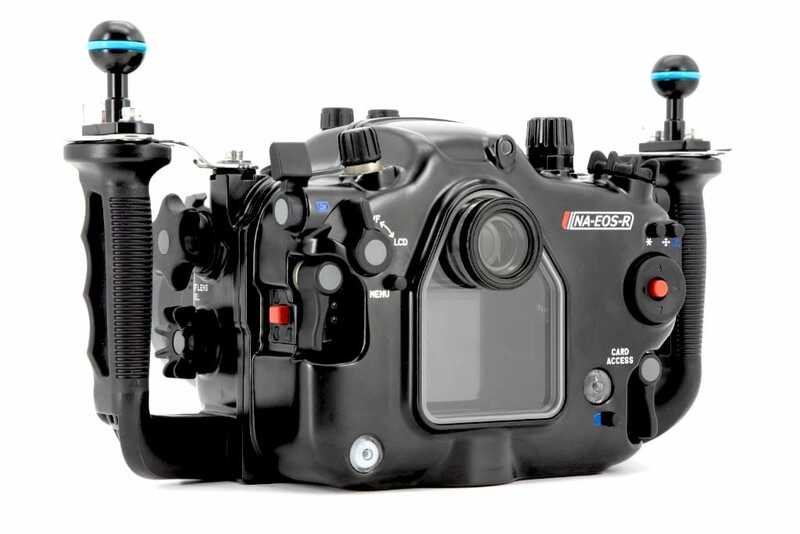 The NA-R underwater housing embodies Nauticam’s drive for innovation. For many, the EOS R is a move from a full-frame Canon DSLR. To support both the legacy EF and native R-mount lenses, Nauticam has equipped the NA-R with an N120 port mount. This large diameter port system allows all existing EF-mount DSLR configurations to be used, and is prepared to accommodate the R Mount lenses that will come. The Canon EOS R is noteworthy as Canon’s first full-frame mirrorless camera, but also impressive is the number of additional features that are now available with the introduction of the RF lens mount. The RF lens mount features a 54mm diameter that allows for larger rear lens elements that are closer to the sensor, providing increased corner and outer edge sharpness. The lenses can also be more compact than equivalent coverage area EF-mount lenses. RF lenses feature a customizable control ring that can be assigned to control various exposure settings. With RF lenses, manual focus is controlled electronically, allowing the direction of rotation of the manual focus ring of the lens to be configured via the camera menu. 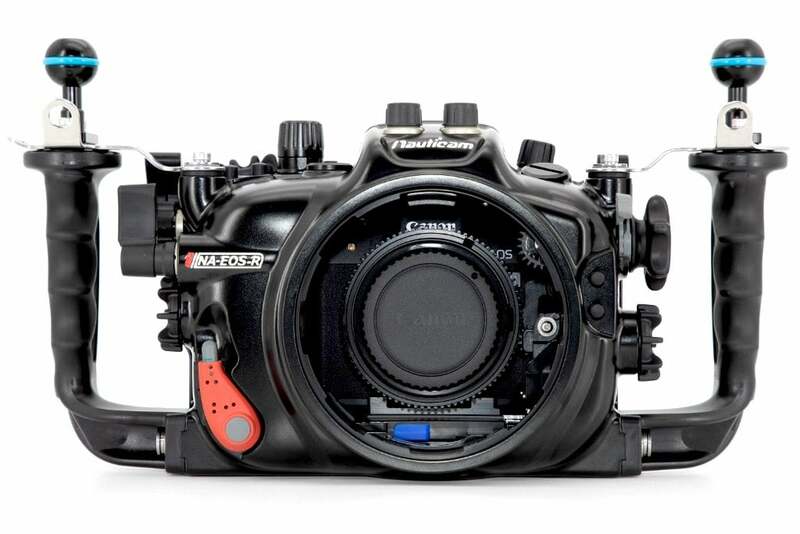 Canon’s EF to RF mount adapters can be mounted on the camera before installation into the housing. 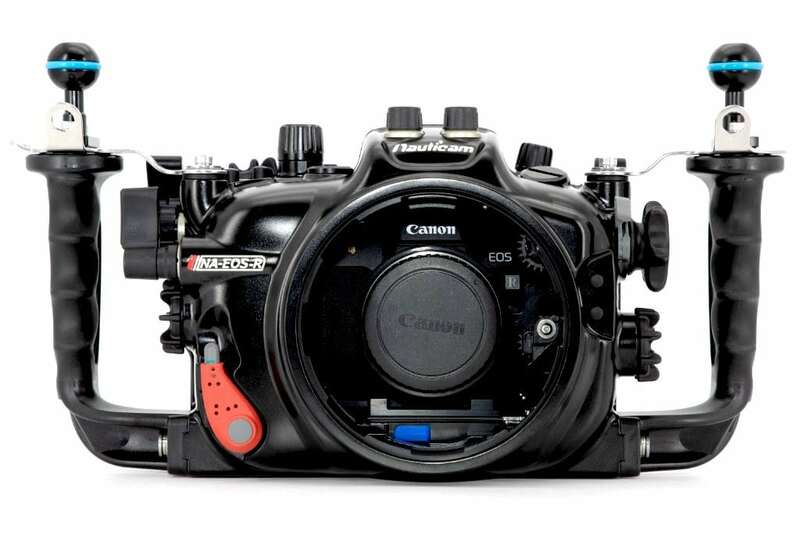 When using the EOS R with the adapter and a supported EF lens, the port and extension ring arrangement will be identical to the same setup on a Nauticam Canon N120 DSLR. 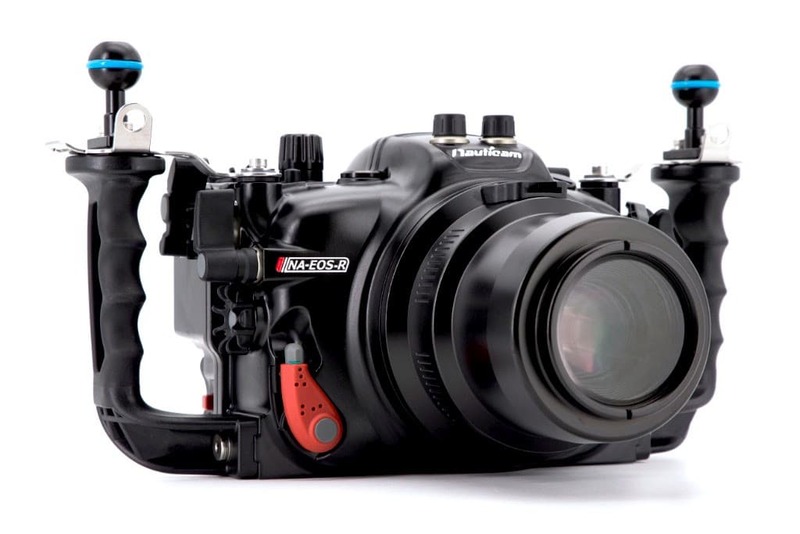 Existing Nauticam DSLR housing owners can easily share lens port accessories with the new NA-R housing. Nauticam engineers are obsessed with providing the most convenient access possible to all key camera controls. This Mission Control philosophy extends to the NA-R where a dual thumb lever and dual sub-lever are placed by the right handle. The upper thumb lever activates the “AF-On” and the lower the “Info” buttons while the sub-lever corresponds to the “M-Fn” and “Record” buttons. 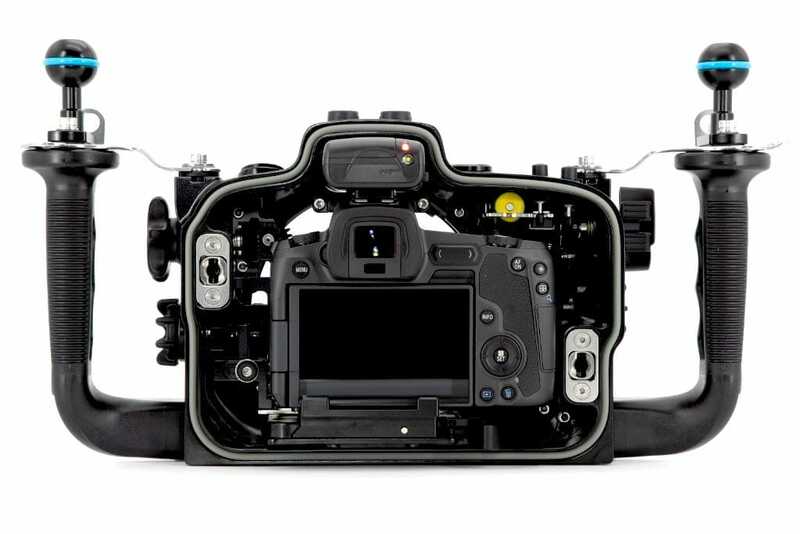 Near the left handle is a thumb lever for “Playback” as well as a dedicated switch to change from using LCD to the EVF. Large knurled and rubberized control dials access the camera’s “main” and “sub” command dials. The two-stage trigger allows for smooth focus and firing activation. Additional buttons for “Menu” and “Focus Point Selection” are also easily reached from the handles. 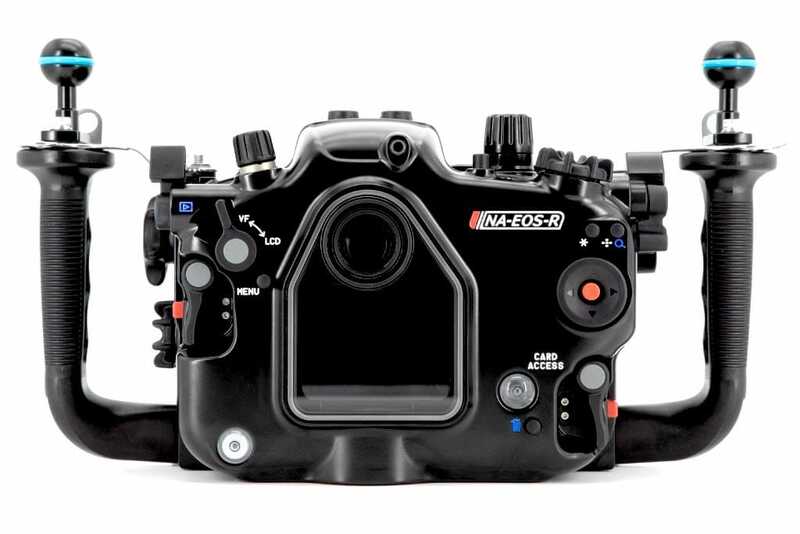 The NA-EOS-R features Nauticam’s signature port locking system. Ports can be easily installed and securely locked in place. The NA-R will support both RF and EF mount lenses through the N120 Port System.